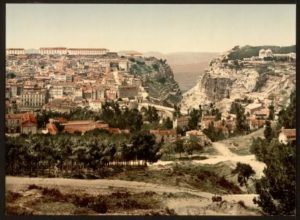 Once known as Cirta, the capital of the Kingdom of Numidia more than 2000 years ago, the city was given its current name in 313AD by Emperor Constantine the Great. While it was at the crossroads of civilisation for centuries, it remains an unknown city to many. 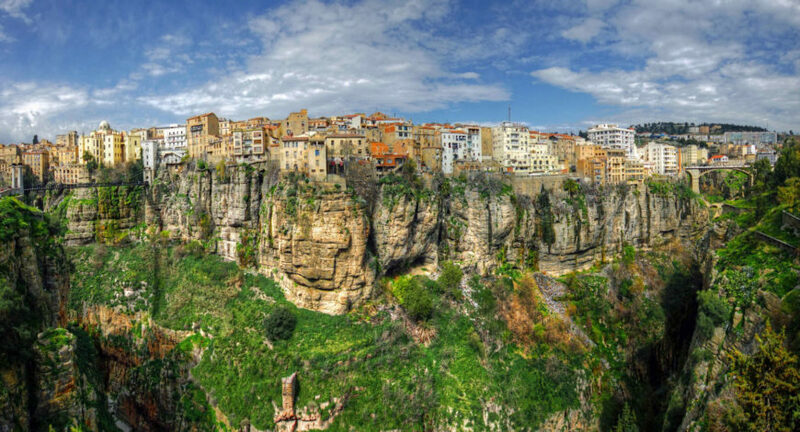 Constantine is renowned for its topography – a mountainous setting rising 649m above sea level. Over millennia the Oued Rhumel (Rhumel River) has carved deep ravines and gorges through the landscape, leaving rocky outcrops on which the city is built and creating a natural fortress that was easy to defend. Bridges connect the peaks and outcrops, creating spectacular vistas where the buildings seem to merge with the cliffs. Seen as a strategic defence point, Constantine has been occupied and ruled at various times by the Phoenicians, the Romans, the Arabs and the Ottomans, until the French conquered the city in 1837. Traces left behind by these different civilisations are still visible today. While caves carved into the rocks point to prehistoric settlements, the Casbah features Roman architecture as well as mansions dating back to Ottoman rule, which lasted from the 16th to 19th century. Although most existing official buildings owe their style to the legacy of French colonialism, Ottoman influences remain noticeable in the city’s architecture, particularly from the period of Salah Bey’s rule between 1770 and 1792. Committed to enhancing and reorganising the urban landscape, Salah Bey was the initiator of numerous historical and religious sites which survive to this day, including Sidi El Kittani and Al Akhdar mosques as well as El Kantara bridge, initially built by the Romans and restored during his rule. Constantine’s natural setting and the numerous bridges and viaducts connecting one peak to another create an extraordinary cityscape thus offers its inhabitants and visitors a unique and picturesque panorama.